Ah, Spring! How I Love Thee! Eleven days in spring is a long time to be gone when you call North Carolina home. Here trees can sprout leaves overnight and grass can grow as high as your knees. One must take spring very seriously here — especially if one is a gardener. 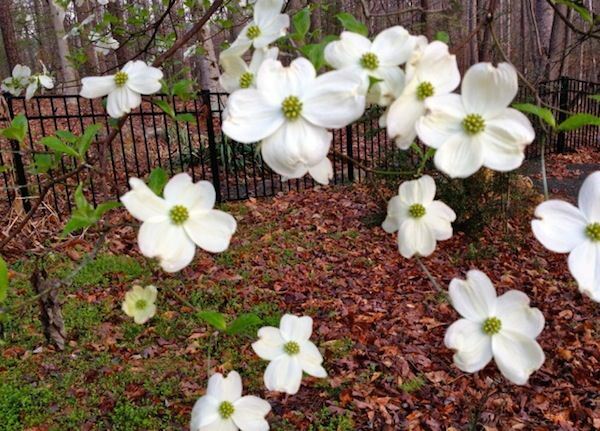 I returned home from my trip to find dogwoods and redbuds in bloom, their respective creamy-white and magenta buds lighting up the gray backdrop I had left behind. I scanned the yard and saw the yellow arms of forsythia swaying in the gentle breeze as the white spirea danced joyfully. All around me trees had sprouted leaves which will soon blanket the woods with a thick canvas of green, screening the house from the street. Never mind that my hands will soon be calloused from all the raking of leaves and digging to move plants from one place to another. Never mind that my fingernails won’t see anything but dirt for the next six months as I weed endlessly. Besides I love the smell of the earth, her soil rich and dark, just as I adore the aroma of burning brush. Today I saw my first hummingbird of the season, hovering where the feeder usually hangs. This little feathered beauty knows exactly what is missing from this garden landscape and he’s demanding to know why I’ve fallen down on the job. Soon butterflies will flit amongst the lavender and yellow blooms of the buddleja, and the gardens, now only showing sprouts of green, will be overflowing with day lilies, echinacea, and rudbeckia. When the sun warms a little more, we’ll spend every evening sitting on the back deck, looking into the picturesque landscape of trees stretching up to a perfect blue Carolina sky. Below us the young chicks will peck the ground for moving insects we can’t see. And, as the night begins to fall, the songs of the tree frogs and crickets will blend perfectly into a soothing melody. This past winter was harsh, even for North Carolina, yet we bravely managed the cold. Now on the other side, we sneeze as we hose the yellow pollen from the loblolly pine off our cars for the second time today. Looking around, it’s a joy to see mother nature waking up after her long winter’s nap and waving her paintbrush to create strokes of rainbows everywhere.